Just like pumpkin pie but without the crust! This is the perfect recipe for those who do not like pie crust. You get all the delicious flavor of pumpkin pie but no crust. 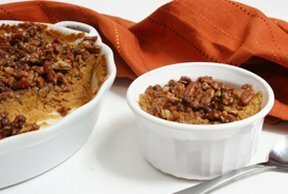 A pecan and brown sugar topping adds extra flavor and a crunchy texture that is just the right finishing touch for this pumpkin custard recipe. This video demonstrates how quick and easy it is to micorwave squash and then create a sweet caramelized finishing touch. Step-by-step instructions on how to make your own pumpkin puree to use in all of your favorite pumpkin dessert recipes.